The 14" cake circle is bright white, grease proof, and made of corrugated cardboard, to ensure that even the heaviest and most cumbersome cakes can be supported and carried. These cake circles are waxed on top, and do not show grease stains or let the grease leak into or through the cardboard like other cake circles. They're perfect as surfaces for decoration. This corrugated grease proof cake pad..is good to use on any cake even buttercream cakes.. because is grease proof..I like too much.. it works as supposed..
we love these 14" cake rounds! super easy to use and very durable for a 6" and 9" 2 tier cake! highly recommended for all bakeries. Solid plates. I placed my round cake on one of these and they are very sturdy and supported the Cake well. It was very easy to transport the cake on these boards. These work great!! i use them for my 10 &12 inch cakes. I usually double up the boards and finish it off with ribbon around the rim to give it a more cleaner look !! 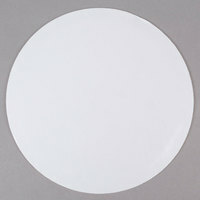 You cant beat the grease proof 14" white cake circle by southern campion! A trusted brand with trusted products that we use over and over again! Love the grease proof. These are definitely worth the price. They are very sturdy. I usually double them in the cakes are three tier. I have never had a problem. Grease Proof is the way to go!! A true life saver!! We use these on 2 different size cakes!! They are sturdy and can handle cakes!! These cake circles work great for pizza. I wouldn't slice your pie on it, but it works for serving to family, your casual diners, or as a base for serving. We send out a lot of pizza, and using this in the box keeps it from getting soggy. I had use this Cake circle for over 2 years,from size8-14,all worked great,they are grease proof,I use for ganache cakes,fondant cakes even whipped cream cakes,very recommended! I'm a home based baker and I use these for all my cakes. They are very sturdy, a great value, and I would purchase again. I use these cake circles for all of my cakes! For larger ones that need more support I use 2-3 of them combined & cover in fanci foil for an elevated look. Highly recommend. These boards are wonderful! You can use them when working with buttercream or fondant. When working with buttercream they do not absorb the oil and cause grease stains on your board. Very sturdy I do double or triple them depending on how big I am making the cake just for added security. I really like this circle grease pad . It is sturdy for my 8X3 tres leches cake and my heart flan cake. I would highly recommend the 14" circle corrugated grease pad. I love the Southern Chamion products.. these 14” rounds are great. Good for large cakes and can be glued together to add more support for heavier cakes. Fits perfect in a 14” Cake Box. Love the grease proof coating.. keeps Cakes looking professionally done. I used to cut out my corrugated circles from a half sheet board, but now i can look more professional with these 14" circles. I'm glad they are grease proof too! I have been using these cake boards for my 10” and 12” three layer cakes. I must tell you I’m really happy with my purchase. My cakes are 3 layers and heavy, these boards are very good quality, non greasy and non slippery and hold my cakes perfectly!! These are awesome for separating the tiers on your wedding cakes. They hold up without getting soggy. Strong and greaseproof. Never want to run out of these. Works well as interior cake boards for tiered cakes. I wouldn't advise for regular cakes on a board as it's plain looking and you can see the corrugated lines on the edges of the board. These cake boards are a staple in our bakery. Doubled up they make a great sized cake board, trimmed with 1/4 inch ribbon. Perfect fit. Bought these hoping/assuming they were grease proof- sadly they weren't. They were labeled as such on the box- however they weren't. There was no coating like it should have had and was dull and the frosting soaked right through. Pretty disappointed considering it was the wrong item in the labeled box. Love these boards. They are good quality grease-proof boards. The cardboard is sturdy, so there is no need to double them. I use these for a variety of different desserts, not just cakes. Grease proof is key! I like this because they are solid cake circles, they don't fold under the pressure of a cake. For the prices, you can't get a better deal! 14" Corrugated Grease Proof White Cake is real good for single 12" cake (with 2" or 2.5" high cake), but with double cake you have be careful every time to pick up the cake. The are the perfect boards, for the perfect price. I double them up to use them as display boards/drums for my cakes. Even dounbling them they are cheaper than buying a cake drum. These cake boards are perfect for larger cakes! I also like to use them for smaller cakes that have larger toys or decorations on them. these are great...i use them for the 12" cakes and these work perfectly. there is enough room around the base to have decoration if you need it or you can double or triple the circles for extra support. These are the BEST cake circles I have ever use! I love the grease proof coating which allows me to wipe them clean after frosting! You just cant beat the price!! A great cake board for 14" cakes. Frosting won't ruin the look of these boards due to the grease proof coating. Nice and sturdy even for a 14" cake. Love these grease proof cake boards! They won'st discolor with your different frosting and can be wiped clean with any mishaps. These work perfectly for a 12" cake (10" as well) and fit beautifully in the 14"x14" cake boxes! These are very durable large circles. Given the weight of our cakes we usually tape a few together cover in foil for taller wedding cakes and such. The 14" grease proof white cake circles are a great product! They do not absorb moisture and keep my cake sturdy. The white finish is also nice enough, that I don't have to cover these before use! These cake boards work well in my bakery. Grease proof lining works very well. The boards are sturdy enough to handle heavy cakes. And you can't beat this price. high quality, durable, greaseproof, and for a great price. I recommend this product to everyone! The cake does not stick to the surface leaving unwanted mess on the board. Very professional quality! This is perfect for larger and deeper pies. This price is the best value that I have come upon. They are also sturdy, and a great option as far as disposable pans go. it is very good for the price. it is perfet. i like that! it is very easy to use. i need buy more next month.